You’ve by now noticed that updates here slowed dramatically this year, and while there are many reasons for that, one major reason was rather prosaic: my laptop kept dying. For many years I’ve been a laptop-only user, and while I did add a desktop late last year, I still use my laptop for nearly everything. Unfortunately it developed intermittent failures which were hard to diagnose and it became frustrating enough that I used the laptop less and less as the year wore on. On its latest visit to Apple a couple of weeks ago they started to check it in for repairs, but then looked at its repair history and wondered if I’d mind if they gave me a new one instead. I was a little puzzled until I realized they wanted to replace it with a new new one, as in the laptops that were announced just a few weeks earlier. 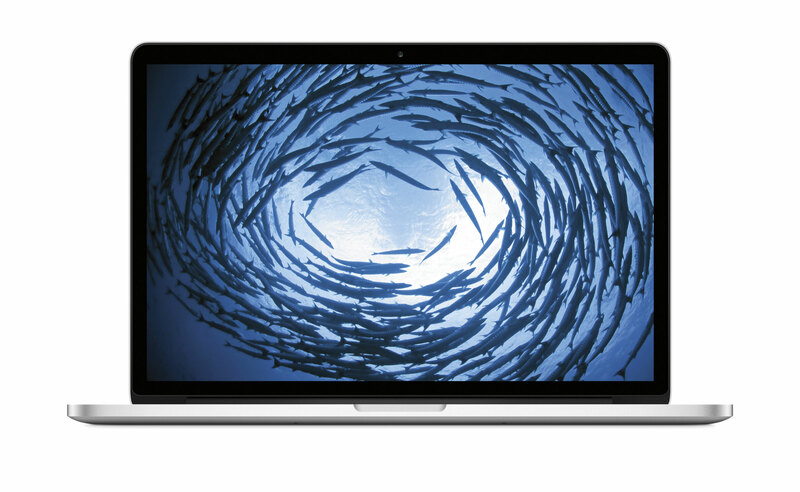 Apple had discontinued the regular MacBook Pro like mine so they wanted to give me the newest Retina model. It doesn’t have some features my old one had, but I didn’t need them, so they custom ordered one for me and it came in late last week. I loved that old laptop and would have preferred that it had never developed problems in the first place, but given that it did, the timing worked out well. It’s hard to believe that laptops have progressed so far in less than three years. It’s noticeably thinner, and more importantly, lighter. Faster, yet quieter. With a much better display, and much faster storage. And yet also with much better battery life. We kept Boo isolated from the other pets in his first days with us by putting him in my wife’s large office in the basement and, since it doesn’t have a door, blocking the large opening into the room with a long piece of plywood. 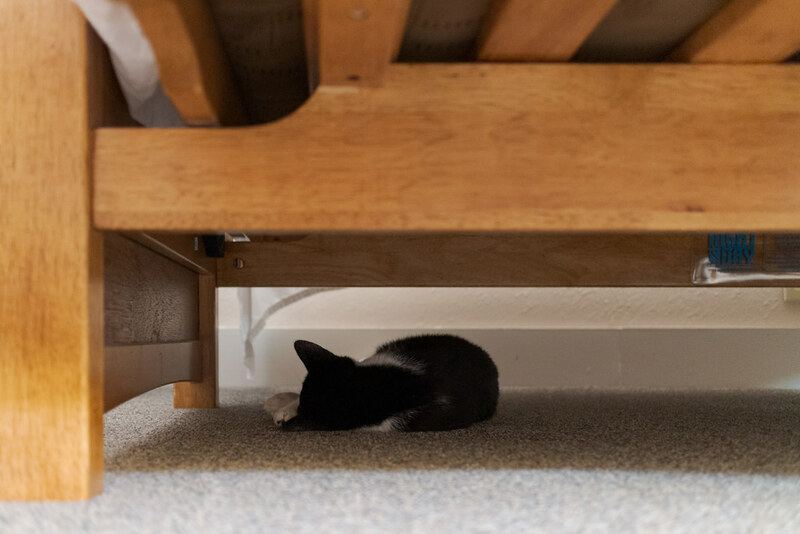 These pictures are from his second day with us, up top you can see him sleeping under the far corner of the futon, which for him was progress as he spent much of those early days hiding completely out of sight behind the desk. 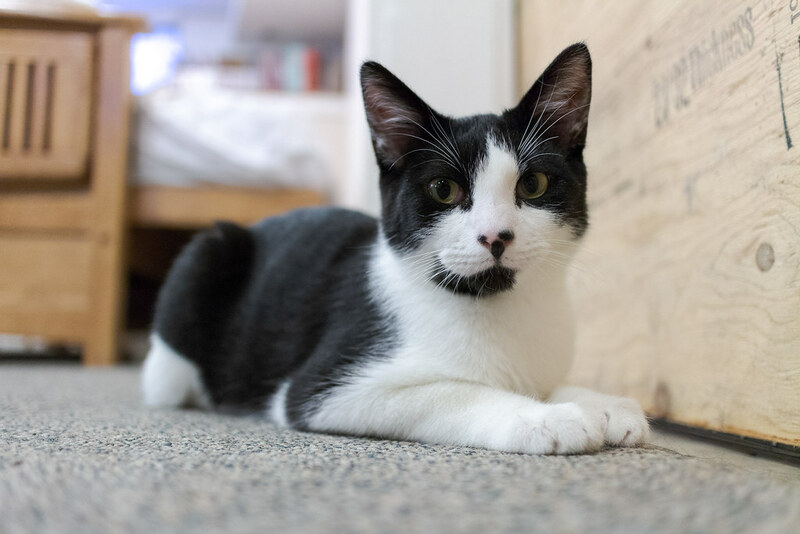 Boo was already anxious and stressed from his weeks at the shelter and adjusting to a new home wasn’t going to be easy for the shy little fellow. But he was anxious in another way too — anxious to meet the other pets. 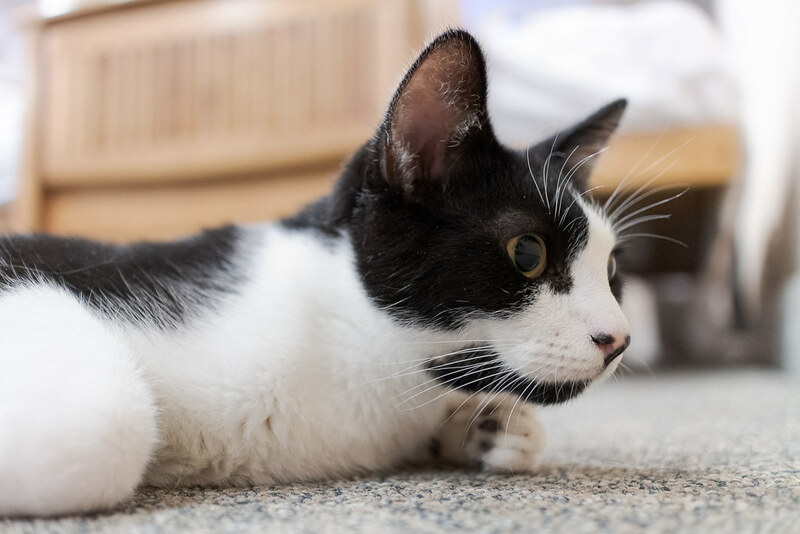 The plywood blocked the exit but he could still hear and smell the pets on the other side, so right from the get go we had to be quick when entering or leaving the room, as a little black-and-white shadow might follow underfoot. 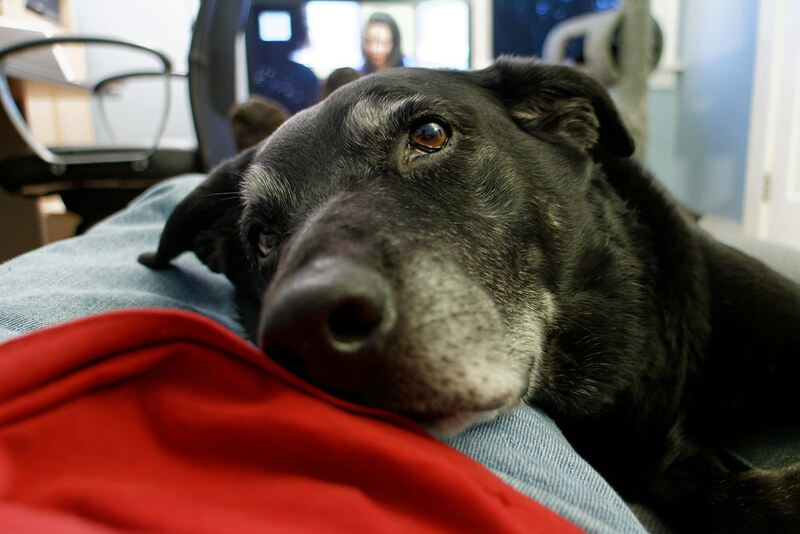 Ellie gazes into my eyes as she lays with her head in my lap. We were so excited when we adopted Ellie almost five years ago, but even so she’s been more wonderful than I could have hoped. 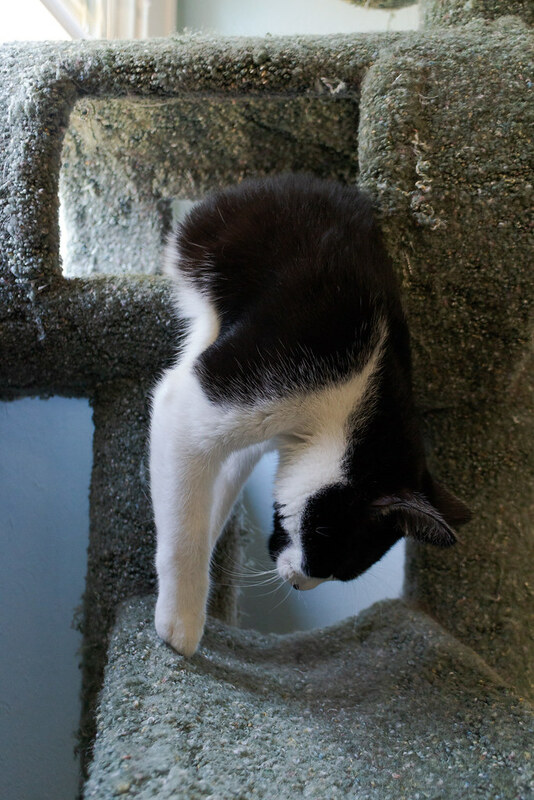 We have a cat for M. C. Escher, so why not one for Salvador Dali too? Taken one day shy of his one month anniversary with us, still skinny enough that he could pull off poses like this when he slept.